For annual periods starting on or after 1st January 2019, IFRS reporters must comply with up to 41 standards. Some are not relevant to unlisted entities, others are so specific, that they are not applicable to most reporters. However, regardless of how many of the 41 IFRS standards a company must apply, there are likely to be a number of challenges in reporting for IFRS entities. Challenges that CaseWare will help to overcome. 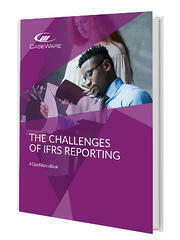 To read more about the challenges of IFRS reporting, download our FREE eBook.